Here’s the thing – so is everyone else. And while LinkedIn is a tremendous tool that really all job seekers and career professional in general should be jumping on and using, it’s not the whole story. Think about it – every hiring manager and recruiter is on LinkedIn as well (good for you, not so much for them). And they’re all “tapping into the same talent pool”, as we say in the recruiting world. As a result, they’re looking to new channels and innovative ways to identify and reach out to candidates. That’s where social media comes in. A recent study put out by CareerArc Group found that using social media ranked among the top 3 most valuable resources for job seekers to connect with opportunities, next to personal referrals and online searches. On the employer side, over 90% of organizations surveyed were using some form of social media in their recruitment process, from employer branding campaigns, customized job search apps and referral programs. Social media is not a solution in its own right, but more of a tool. Your LinkedIn profile or Behance portfolio won’t replace your traditional resume. But a consistently branded online presence that markets your skills, experience and value will help employer find you, and also give you an additional platform in which to highlight and express your expertise, where your resume is slightly more limited. Still, social media is often regarded as more of a personal outlet than one that’s appropriate for professional purposes, but that really comes down to leveraging the right networks for reaching your target audience, and maintaining a professional reputation. So without going into a million statistics, what are just some of the high-level benefits of bringing a social media strategy into the job search mix? A resume is an outbound marketing tool, meaning you typically send it to a specific prospect that you’ve identified and are reaching out to. Social media acts as an inbound marketing tool, giving employers a place to find and engage with you based on criteria that’s of interest and value to them. While they don’t replace the resume, platforms like LinkedIn are considered a professional standard, and a key component of your online brand presence. Google+ is following suit, and for creatives, portfolio sites like Behance are serving that market with easy to customize portfolio solutions for presenting your work to potential employers and clients. These days, an online portfolio that’s easy to access in one click is essential. More recruiters and hiring managers than ever are using online channels to identify, connect with, and qualify candidates. This includes platforms like Twitter and even Facebook, as the ability to connect to people through shared interests essentially drives these networks and helps hiring managers zero in on who the current and emerging thought leaders are in their industry. With a resume, or even cover letter alone, you’re really limited to what you can say based upon information that’s acceptable to include. Think about what other ideas you want to communicate about yourself, and what channels might be able to help you do that. Pinterest is a great channel for connecting your personal passions with your professional pursuits, and showing that you’re in touch with relevant trends of say, industries you want to break into. About.me allows you to create a customized landing pages that brings all of your profiles together in one place, while also giving you free reign to create a more detailed, branded bio about yourself. Twitter is a great way to reach out and connect with peers in your field, and build more visibility around your industry-relevant blog. Together, these channels offer information that tells a story about your career, which is way more impactful than a formalized list of experience and skills (that’s important too). It’s quite simple – the bigger a presence you have, and in the most appropriate places for your target specialty, the likelier you are to be found by folks who are searching for qualified candidates in your field. And being on the larger networks will boost your search optimization as well. If you Google my name (Dana Leavy-Detrick), you will probably find that the first entries that come up are my Twitter profile, my LinkedIn profile, my Pinterest profile, my company Facebook page, and my professional profile on a number of independent career and media sites such as Levo League and Quora. By looking at the first couple of entries alone, it’s already clear what it is I do and the industry I’m involved in. This is a huge topic, and I’ll definitely be diving into it more in the coming weeks, as we explore more tools, statistics and best practices for leveraging social media in your job search, connecting with key hiring managers and influencers, and building visibility and credibility that’s going to help you stand out in this competitive market. 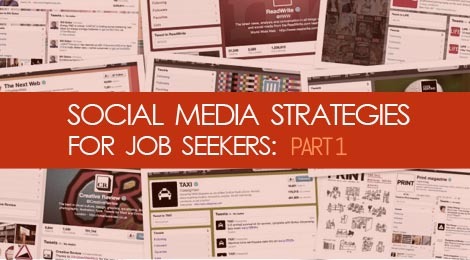 Leveraging Social Media in Your Job Search (Part 2) – You’ve got the reasons, now put ’em into action!